Global reference frames are based on the coordinates of observatories on the Earth’s surface employing geodetic space techniques. In a first order approximation the observatories represent a cospherical point field. The existing global reference frames are based on an inhomogeneous distribution of the observing sites. It is possible to improve the homogeneity of the cospherical point distribution in an optimized manner by adding new observatories at the center point of the largest empty circle on the sphere. The sequential adding of new platforms will converge to a homogeneous point distribution. 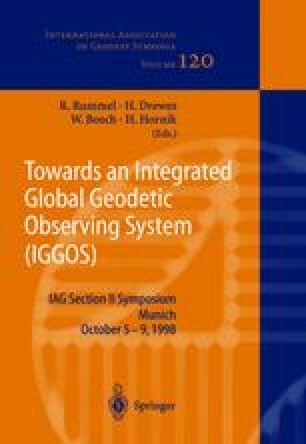 This method was applied to the distribution of fundamental stations in order to find geometrically the best sites on which possibly the Transportable Integrated Geodetic Observatory (TIGO) could be operated.